Today’s update will be very short. You will be receiving two of them at once anyway when Lindsey and Mike get back in town, and I need to get moving. We spent a very pleasant evening with Steve and Carol, the cyclists we met on Friday. Went to dinner, visited for quite a while afterwards. Interesting, nice people. Suddenly it was past bedtime and the time I usually spend writing was gone. Hills the first 10 miles or so, then flat, flat, flat, with a crosswind or a tailwind thank goodness. Saw a sign about a road closed at a bridge, but persevered, hoping a bike could get through. Worked out fine-bridge just one lane for roadwork! Beautiful ride. 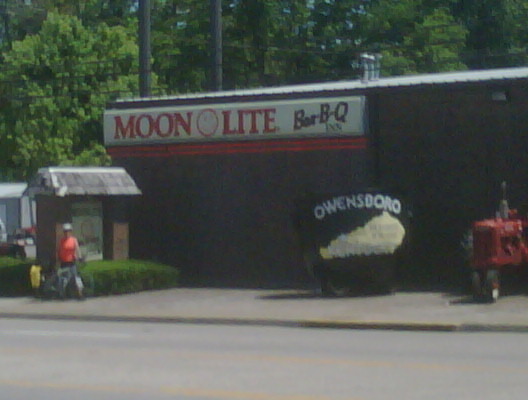 Arrived in time for late lunch at the Moonlite Barbecue, apparently locally famous and a destination restaurant. A friend had told us to look it up, so there I am standing in front. 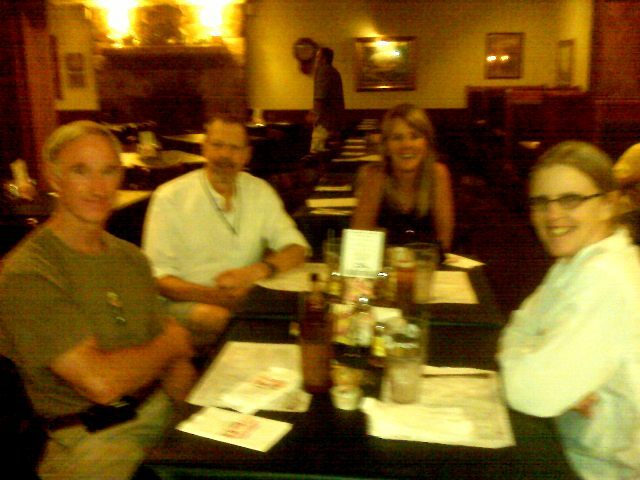 We ended up back there for dinner as a foursome, which is the other picture. Tomorrow is a big day for two reasons. We pass into Indiana, and we leave the Adventure Cycling route, which means we start what I’ve been calling Leg 3 of the trip. I’m a little apprehensive, actually, because now we’re back on my own routing. We may spend the day re-routing! 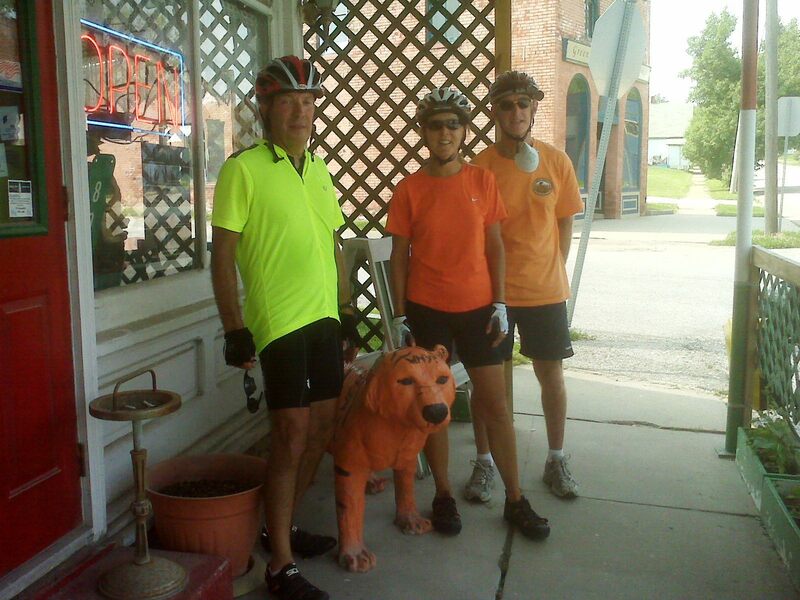 We ended up in Jasper, about 9 miles past our intended destination of Huntingburg. It didn’t seem like a lot to add to the ride, and puts us in a bigger town tomorrow for our off day. This will also shorten our day into Bloomfield on Tuesday. We started our day at breakfast with Steve and Carol at the Holiday Inn Express. Shared a few more stories, exchanged contact information, and went on our separate ways. We headed straight north and they will continue east/northeast on the Adventure Cycling Route. They will end up riding 2600 miles in six weeks compared to our 1700 or so in the same time. We crossed into Indiana on the bridge from Owensboro, north over the Ohio River. For some reason I have been stressing over this bridge crossing for a full year, ever since I crossed it in car while scoping out this part of the route. Long bridge, because it’s a large river, and no shoulder or sidewalk, so I knew we’d have no choice but to get out and take the lane, for safety. At this point, we’ve crossed so many bridges, it just didn’t seem like a big deal. We’ve run the gamut from walking on the sidewalks,to riding the shoulders and taking the lane. This crossing was uneventful. It was a fortuitous happenstance (oxymoron? redundant?) that we crossed on a Sunday morning and traffic was light. Most people think of the entire state of Indiana as being flat, but the lower third or so is rolling hills, combined with flats. We only climbed about 756 feet today, which was just enough to break up the monotony of miles of flat riding. We had a tailwind for much of the day, which allowed us to arrive here without being totally exhausted. We stuck to my planned route, and it worked out OK. It seemed like when there was no shoulder, there was also not much traffic. When the traffic increased there was a decent shoulder. At the end of the day traffic became very, very heavy but it didn’t matter because we had a shoulder the width of a full lane. We are routed on this same highway for three more days, but we will see how it feels on a weekday. We did try one alternative back road early today, and it quickly turned to gravel. Our expectations for Indiana roads are not to deliver the experience we had in Tennessee and Kentucky. We expect more of a businesslike approach, just moving northward and checking off the miles. Speaking of miles, we reached the 1000 mile mark today. Another milestone. Every little bit keeps us going. We agree that this second 500 miles passed more quickly than the first. We ate a roadside lunch at 40 miles next to a crossroads grocery in Gentryville, Indiana, then stopped about 12 miles later to rest and change maps. I try to be sure that we stop more often than we feel the need, especially in this heat. It was so hot today that my bar of face soap melted in my pannier (fortunately, in a Ziploc). We had just pulled over to a shady corner when a man in a white PT Cruiser pulled up and asked us if we’d like some ice water, said he lived just a couple houses down the road. We had plenty of liquids on the bikes and at first told him no, thank you, but ice water sounded really good, and why are we out here anyway if we’re not going to talk to nice people? He was anxious to help us, and I think you can trust anyone who drives a PT Cruiser. So off we went. We spent a very pleasant half hour in his back yard on a swing in the shade, met his granddaughter, talked about his health, his love of northern Michigan, and his relatives in Warner Robins, Georgia. It was a great rest break. We’re back on eastern time. Indiana varies, I think by county, and apparently the people of this county didn’t like the fact that it got dark at 4:30 in the winter. So we were 6:30 checking in, having lost an hour. Ate Chinese buffet at the restaurant at the Days Inn. Will venture out and explore the town tomorrow. It appears to have some promise. We have a nice pool here and plan to rest there for a good part of the day. Tomorrow is Tom’s 60th birthday. I will try to make it as special as possible for him, although he hates to be the center of attention. Tom’s birthday! Thanks to so many of you for your e-mails and texts to him. It made us feel very connected. It has been another very hot, sunny day. 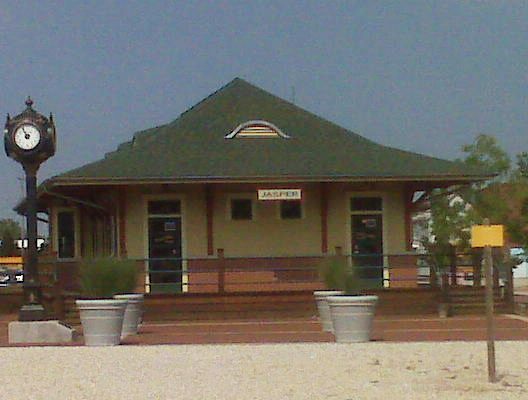 We walked around town this morning, including the railroad depot in the picture and the nice courthouse square. We bought a few essentials, had lunch at a local deli, and spent the rest of the day at the nice pool, which we had to ourselves. Thought about a movie at the theater next door, but may not fit that in. We plan to eat dinner at a well-known German restaurant recommended to us by several different friends who know this area. We understand they have very good fried chicken! Jasper has a strong German heritage which is displayed by many of the local business names. There are some furniture businesses here and Jasper Engines and Transmissions, a name Tom recognized. There are some nice spots, including a small riverwalk area next to us at the motel. We will try to get an early start tomorrow, which will be a challenge. I’m not a morning person, but we’ve been waking up around 7:00. With the change back to EST, though, we’ll have to work to get out early. It appears the wind really whips up in the late afternoons on these hot days, and the traffic seems to get worse. My friend Tammy asked a good question, about how many hours we spend on the bikes a day. We are typically in the saddle for 5 to 6 hours, but of course our day on the road is longer because of rest breaks. It’s amazing how quickly the day passes. Tomorrow evening we will meet up with our friend Gary Scott, a Torch Lake friend of many years and an avid cyclist (and long distance runner). 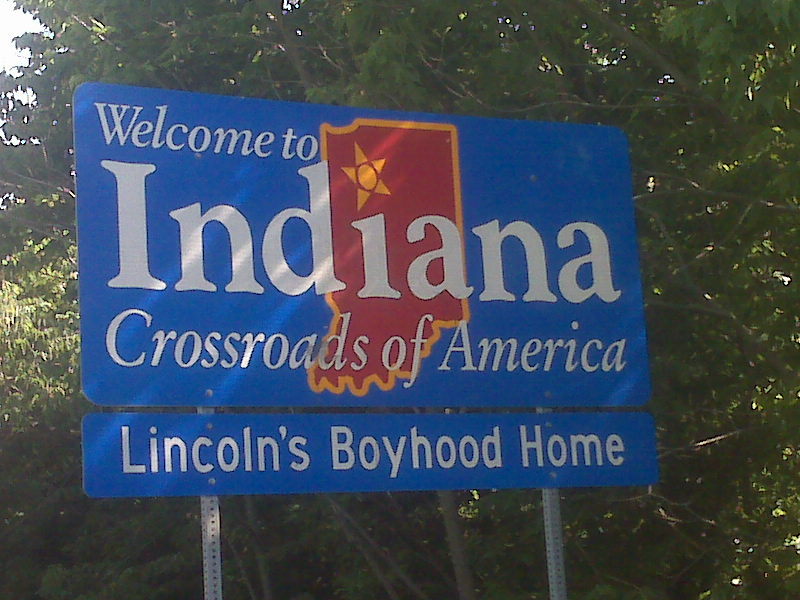 He lives in the Indianapolis area and will meet us in Bloomfield, Indiana, and ride into Greencastle with us. We have been looking forward to his company since the beginning, but it has been hard for him to plan, as our target date kept shifting. We think we have it nailed down now so we’ll get to spend the day riding together. We are far slower than Gary at the best of times, so I can only imagine how painfully slow this will be for him. But we have warned him, and he is coming anyway. Nancy Jordan, send me an e-mail so I can reply to you! I’ve tried to write to you twice and I can’t seem to get your address right! I didn’t take a single picture today. Early in the day we tried to get off the highway, and rode through all kinds of picturesque Indiana farmland. At that point I thought there would be a whole day of that ahead, so I was in no hurry to choose a shot. The back road turned into gravel, the experiment cost us ten miles, and we spent the remainder of the day on Hwy. 231. I was concentrating far too much on the cars behind me to worry about pictures. We did get an early-ish start, at 8:15, which helped with traffic and heat. Of course we burned that time with my back road project. We still arrived in Bloomfield around 4:00. The day was constant rolling hills, with over 2000 miles of climbing, but nothing awful. We are staying in the only motel in town, the very run-down Sleepy Hollow Inn, which is part of the Marathon gas station and the Picnic Basket convenience store. It is seriously run down, but clean. Once again, all we really need is a clean bed and a shower at the end of 50 miles. The beds feel like they might be stuffed with straw. And instead we got a full-scale Italian restaurant. All three of our dinners were some of the best we’ve had, and very reasonably priced. We’re ready for bed and hopefully a not-late start tomorrow. We’ll see how we sleep on the straw mattresses! Destination tomorrow is Greencastle, Indiana, home of Depauw University. We rode Hwy. 231 all day again today. It was busy, but again there was always an adequate shoulder, and for one 18 mile stretch, a shoulder the width of a lane. No great pictures, just businesslike riding to get here. It was very hot, and very hilly, but once more, rolling hills and no lung-busters. Of course, nothing like the “2000 miles” (oops) we climbed yesterday, but a respectable 1800 feet. It was great having Gary with us. He had rotator cuff surgery a few months ago and is still getting back to his previous activity level, so this was a test of sorts for him. He did great, and I think enjoyed the day. Gary’s part of an extended “DePauw University family”, so it was great to have a guide around town. We visited one of the traditional Greencastle watering holes, Moore’s, when we arrived, then went to a local restaurant, Mama somebody’s? for dinner. The proprietor had seen us across the street taking pictures at one of Gary’s old favorites, and, not to be outdone, had us come over to his place for pictures. Thus the three of us with the tiger. He made his dinner sound so good that we returned to eat there. We have at least four friends at Torch Lake who attended DePauw, and have heard about it for so many years it has become almost legendary. It was very meaningful to finally see it and spend an afternoon and evening around the campus and in town. Tomorrow we head out, again on Hwy. 231, north to Crawfordsville, then northeast to Thorntown and the home of our very good Torch Lake friends, the Ragsdales. We will take an off day at their house, so will be there for two nights. We have been looking forward to this the entire trip, and it has been a goal as well. We’ve been saying things like, “when we get to Eric and Kari’s, we’ll only have x-number of miles, or days, or vitamins, left!”. Tom says when we get there he will really feel like we’re halfway there (never mind that we’ll actually be two-thirds of the way there). Anyway, we’re excited about being at the Ragsdales’ and seeing them. Today [May 28] is an off-day so I am actually writing yesterday’s update this morning (???). 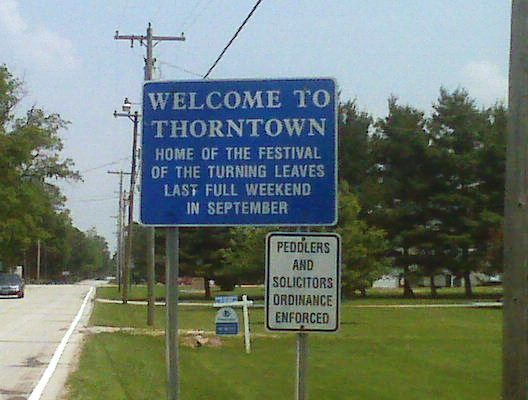 We arrived in Thorntown at about 2:30, after stopping to take a picture of the all-important “Welcome to Thorntown” sign. We assume when they refer to peddlars, they don’t mean our kind of peddalers. This belief would be reinforced by the sign Eric had put up in town, welcoming us. We were very flattered. We stopped to see Eric at the bank from which he runs the universe of Thorntown’s financial happenings, and he led us to the house in his truck. After settling us in and opening the pool, he returned to work to finish up. Meantime, Kari had arrived home from work, and we quickly settled into Torch Lake mode, sitting around the pool and catching up on news. The kids came home from school, Eric came back, and we spent several relaxing hours together. The Ragsdale family have become such good friends and such a big part of our Torch Lake summers, this is almost like visiting family. Of course it doesn’t stop there, as their extended family members are all friends of ours as well. Eric’s mother Patty was able to come to visit for a couple of hours last night, and tonight there will be 16 of us, including Patti and Dave Causemaker. 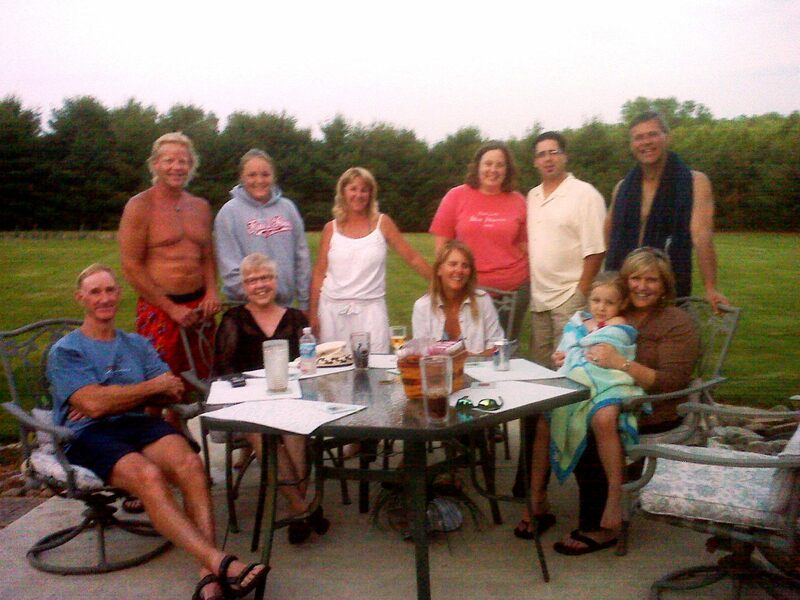 What fun, a great dose of Torch lake togetherness! We had shipped a box of supplies to ourselves here, including all the paper maps for the remainder of the ride. Much of what we sent was a new supply of toiletries, and warmer clothes, in anticipation of the much cooler and sometimes cold weather in northern Indiana and Michigan in June. It’s hard to imagine now that we will need those, so we’ll have to make decisions about what to take and what to leave for Eric and Kari to bring to us. It’s a great luxury to have that option. We will finish laundry, ride or walk back into town for lunch, and maybe find a haircut for Tom. Then we will spend the afternoon at the pool. I need to review the new maps, and make some plans for the next few days. I have projected our daily destinations for the entire trip, but it has occurred to me that we need to be off the road very early on Monday, before people start coming home from their holiday weekend in droves, possibly drunk but certainly tired. That will require some shifting of plans. Had a great, relaxing day. Hot and sunny, so perfect for the pool. Tom did a little cleaning and lubing on the bikes and we’re ready to go. We hadn’t even put air in our tires, on the theory there was still more air in them than we would be able to get in with our frame pump. Gary had a nice floor pump in his car the other day, so Tom topped off the tires, and we could feel a slight difference. We had a wonderful evening, the 12 of us plus the ghost family of 4 that I apparently invited (I had said there would be 16). That’s all of us in the picture, minus Sam Ragsdale who was taking it. We stayed out until the beautiful full moon rose over the pine trees and went to bed too late. Here’s hoping for a south wind today. Our ride will be completely flat and headed north. I’m so excited you’re going to be in Greencastle! Our home town! DePauw our collage!